Here are Ed and Adrian discussing the machine with Joseph Okor from the FabLab in the South South End Technology Center in Boston. The Lab's Ed Baafi is behind the camera. We hacked in an old PC power supply they had lying about to get it running. However, this was a FabLab, so they soon equipped Adrian with a soldering iron, and he unplugged the extruder and re-soldered the lead to the thermistor which was causing the problem. And we were able to make them the start of the shot glass before it was time to pack up and go home. Thanks to Ed and Joseph, and also to Neil Gershenfeld whom we had met there earlier in the day, for their hospitality. 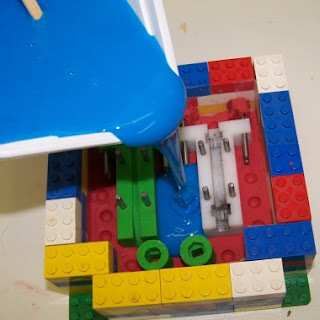 We shall send them a RepRap extruder so they can experiment with integrating it in one of their systems. The Canadian Broadcasting Corporation did an interview with Adrian over a Skype connection. The voice quality was exquisite, though there were a couple of drop-outs. 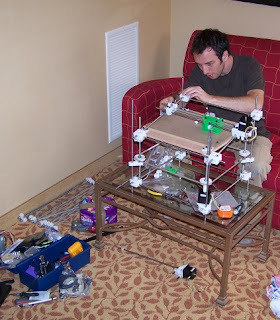 As always, Adrian gives a very good interview on RepRap. 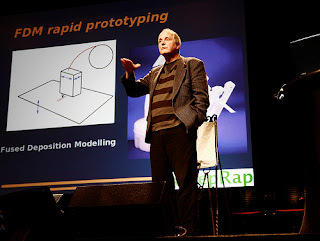 Here is RepRap (and me) at Pop!Tech - one of the most eclectic and entertaining conferences in the world. Thanks to them for the invitation to present the project. RepRap was in a session with Matt and Jessica Flannery's Kiva, which is another extraordinarily good idea - visit their website too. We made an impression, and got a RepRap version 1.0 "Darwin" set up and working in the conference coffee area, where it excited considerable interest (especially when the extrude head jammed for a few minutes with an expensive crunching noise...). Just for kicks, I printed out a couple of belt clamps and a pulley. Oh, and about 95% of an X-axis restraint (software crash, blue-tinged air etc.) but it looks like we're on our way to starting an X-axis here. I've switched to a 0.78mm nozzle now, and the new shape is an improvement in preventing strings - or at least shedding them quickly - but not much so. Also having a few problems with PLA not adhering to my new machine bed so well. Hopefully a good wipe-down with acetone and a scrape with a wire brush (for the Reprap, not me) will improve things. OK, here's the tidied up version. I had to ream out the vertical holes by hand, the horizontal holes were fine and just needed de-stringing. I have seen how threads of molten plastic climb up the curved surface of an acorn nut nozzle and I'm modifying one to see if I can reduce the stringing. The holes in general were smeared somewhat, mostly due to a soon-to-be-fixed software bug which resulted in the extruder not being turned off at appropriate moments. In the previous post, you can see the part starting to curl like a king-size mattress being stuffed into a queen-size fitted sheet. The curl is not very pronounced, but did distort the 8mm holes making the insertion of an 8mm rod very tight indeed - you can see shavings on the end closest to the camera. The nuts fitted into the rectangular slots at the top without a problem. The other holes were a little tight and required gentle persuasion to drive the nuts home - a bolt and very large washer was used to winch them in. What didn't fit was the nut down the channel in the 8mm hole. My reaming didn't clean that out enough and I had to resort to a dremmel tool. It near enough works and I'll be building it into a Reprap as soon as I can. I'm extruding in 0.55mm layers, 1.62mm outline size and 0.73mm infill size from a 0.86mm nozzle. Max x-y movement speed is set to 238. This gives fat outlines, but because of the jerky movement between points by the head, curved lines are fatter than straight lines and the slow speed minimises the difference in width. A very respectable 0.5mm width wall was printed by mistake during a buggy phase of this printout when the nozzle moved without being turned off, but this is good as it shows what the hardware is actually capable of - even with a 0.86mm nozzle. Here's the pretty side of 11 1/2 hours of Reprapping. 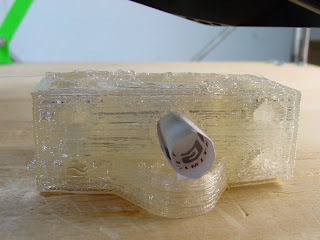 You can see that the PLA started to curl - I'm not cooling layers here so I might have to get that working again. The paper tube is because I realised half way through that the hole for the axle was not Reprap-friendly as it was not pointed. So I quickly rolled up a bit of the nearest thing to hand (a Catalyst compliments slip as it happens) and poked it in the 3/4 complete hole. I had to roll it around a bit of 6mm rod as a guide to slip it in. The Reprap-friendly hole shape is quite clear in the top right corner. The loops on the left edge are caused by the nozzle erroneously seeking warmth in its corner due to temperature reading bugs. Anyway, I'll tidy it up and take some pretty photos tomorrow. Kinda tired right now. Continuing on the beverage container theme, we now have a wine glass. Actually, we now have two. Measuring the second shows a 72.9mm height, compared with the expected 70mm so I have tweaked the Z scaling accordingly. Why the beverage glass fetish? Well, apart from being an old soak, they're not very taxing on the construction algorithm and it's obvious when they are either not watertight or asymmetrical. 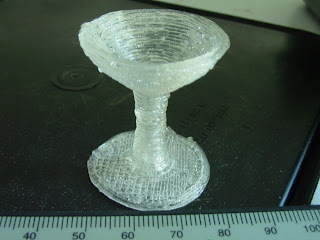 Also, I wanted to do overhangs, and a thin-stemmed glass looked to be a good demonstration of the ability of the RepRap to do overhangs. 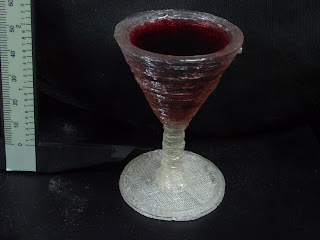 One martini glass. Now the reprap's head doesn't bob around, I can make some surprisingly delicate structures. 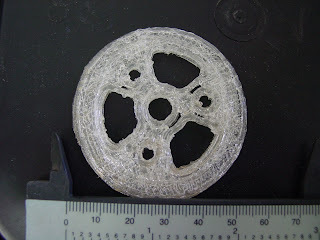 This object was printed without any forced cooling - or cooling delays - at all. 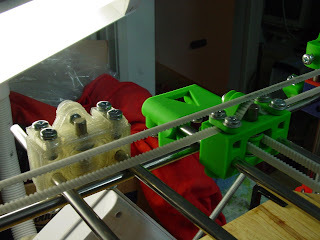 Here's a photo of the Z-axis pulley rim that fits on top of the Z axis gear. I've pulled off all the stringy bits and reamed the holes out with just a drill bit held in my bare hand to clear the thin cruddy bits out. As you can see, it's not too shabby. Anyway, here are the modifications I did to the Darwin to get PLA coming out. A. Oily rag in holder to lubricate filament. B. Large 12V motor to push filament through. 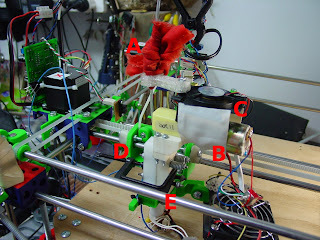 C. Fan to stop polymorph motor holder melting. D. Polymorph saddles to stop excessive rotation of carriage. E. Clamp to apply extra pressure to filament. You can't see it in this photo, but also I flopped the extruder "umbilical cord" over to the side so that it doesn't tangle with the filament feed. 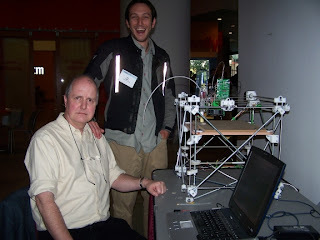 Zach, Sebastien, Ed and I had a paper on RepRap accepted by the 2007 Mass Customization and Personalization Conference at MIT. Ed and I registered for the conference and we decided to bring Darwin along to show as well as presenting our paper. 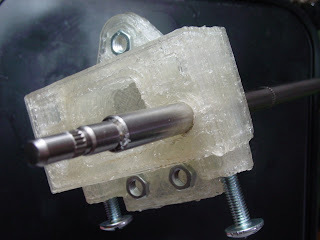 As all you avid RRblog followers know, one of the things we've been doing is looking into using soft moulding to allow us to make RepRap components from the rapid-prototyped masters to sell in the RepRap online shop as a stopgap until there are enough RepRap machines out there to be making stuff directly. I have now put complete instructions on how to do this on the wiki here.